Who but Inserch knows all about what stylish grown men like to wear when it's Friday night. You'll find the styles of classy menswear from Inserch reflect a certain fashion mindedness that other brands struggle to grasp. This rich blue plaid 2 piece casual walking suit features the classy style that doesn't scream out to others but is very sharp looking. 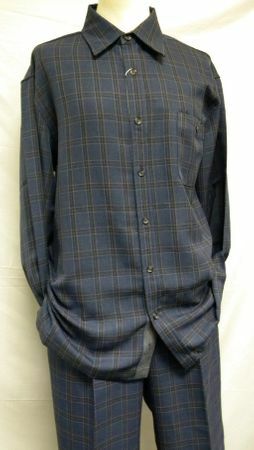 Featuring pleated pants to match, this blue plaid outfit reflects what Inserch menswear is all about. Made of soft poly/rayon fabric.